The idea of playing as a sniper in World War 2 makes for an excellent premise for a videogame, one that could possibly give space to a host of different stories and titles. Sniper Elite 4 still has little in the way of story, but its setting is probably one of the franchise’s potentially most beautiful locales: the coast of Italy. Our protagonist, an American sniper working for the Allies in order to dismantle the Axis war machine, hitting its historically least powerful side, the forces of Benito Mussolini. If you’ve played the previous entry, which took place in the northern part of Africa, Sniper Elite 4 should feel extremely familiar. The core gameplay remains intact, with a few new additions that make things a little more interesting. For the uninitiated, Sniper Elite 4 (and its two previous entries, because the first was pretty much an FPS) are third-person games that take place in huge maps with pretty open ended approaches to the mission objectives. Go in stealth, shoot your way, mix both or, heck, explode everything. It’s up to you. For me, though, these are games all about stealth, so my time with the E3 demo was spent skulking around, carefully and silently picking off foes. I never really made use of the series’ trademark sniper rifle, although I did have an easier time knowing my character’s relation in regards to the enemies thanks to the new presence circle marker on the mini-map, which basically displays the amount of visibility you have in relation to the enemy. If they happen to enter that circle, they can see you, making things hairy if you happen to be playing like I was. The mission shown in the demo tasked me with destroying a gun emplacement that happens to ride on a train track, which coincidentally stopped in the middle of a bridge overlooking a canyon. Sounds familiar? Yeah, a ton of movies that took place in WW2 had the same premise, but it was neat to see it in videogame form. I started way in the back of the map, at the entrance to the valley, at the top of a hill overlooking the bridge. The map was huge, and it was not easy to make my initial approach, thanks to the long winding roads and the carefully placed sentries on the way. Chaos obviously ensued, because of course I screwed up. I got caught as I blundered my way down a slope like a klutz. Even so, it was quality time with the game all the same, because Rebellion’s dev on-site was able to fill me in in regards to the new intelligence routine for soldiers and sentries. In Sniper Elite 4, like previous games, Axis soldiers don’t automatically give up search if they don’t find you, but now they eventually go back to their routines in slow fashion if you remain undetected instead of just forgetting you were ever there. It’s a tenuous difference, but still noticeable. I was also able to pick up on how their alerted phase didn’t carry over to the entire map, but in parts. Cutting to the chase, I survived. Sadly, that was when the demo ended. 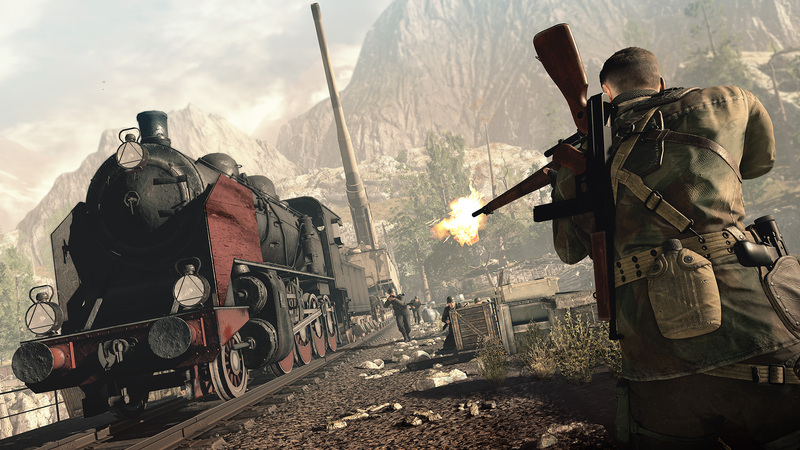 As with Sniper Elite 3, 4 is a real looker. Even in alpha demo form, the game is looking gorgeous, with terrific use of real-time lighting and some very realistic looking foliage. Even though it doesn’t really stray far at all from the foundation set by Sniper Elite 2 and 3, Sniper Elite 4 is shaping up to be a fun continuation for the franchise. And if this demo’s any indication, it’s going to be just as or even more challenging than anything that came before it. It’ll still be a while til we find out, Sniper Elite 4 will be making its way to consoles and the PC in early 2017.